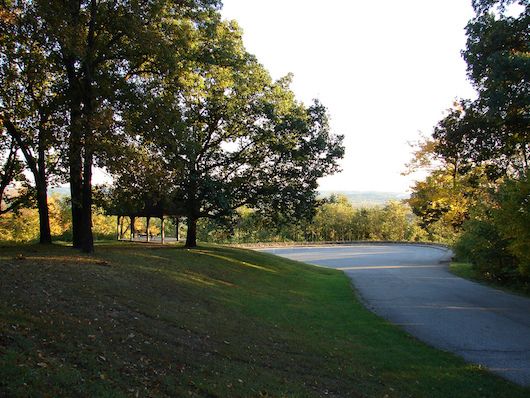 Designed by Frederick Law Olmsted as “Louisville’s Yellowstone”, Iriquois Park was planned to be a scenic reservation of forested hillside and vista views. Located 10 miles south of downtown, the 739 acre park features an Iroquois amphitheater, basketball courts, and an 18-hole golf course. It is a popular local venue for concerts, musicals, and other shows. There are great views of the city from the top of the park. The park offers many running paths, with the longest being Rundhill Road at 3.5 miles, followed by New Cut Road Path at 1.6 miles and Uppill Road Path at 1.5 miles. The paths can be combined to lengthen a run. Each path has its own unique qualities. Those looking for a loop run should choose Rundhill Road, while those looking to run a there-and-back route with minimal elevation gain should choose New Cut Road. Uppill Road will take runners to the summit where the view of Louisville can be seen. Hilly! Rundhill Road is 166 Ft. and Uppill Road Path is 172 Ft. Bus route 4 and 6 both have stops along New Cut Road where the entrance to the park is.